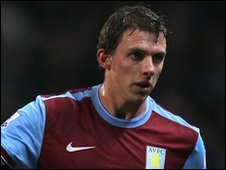 Aston Villa left-back Stephen Warnock is to have two weeks complete rest in the hope of being fit for the Carling Cup final against Manchester United. The former Blackburn defender has seen a specialist about the shin injury that is currently keeping him out of action. "Stephen will have to rest for a while - we'll have a look in a couple of weeks," Villa boss Martin O'Neill told the club's website. "We will have to see if it settles down - obviously he's desperate to play." Meanwhile Villa striker John Carew is back in full training after overcoming a knee problem. Young winger Marc Albrighton, 20, is also close to a return after limping off during the FA Cup fourth round victory over Brighton.